The Korean mania is on! People just love everything Korean, from their k dramas, food, glass glowing skin, makeup, and clothes. I have heard there are long lines at the Korean embassy because many Filipinos are getting visas to be able to visit the "land of morning calm". Dae-bak (or super cool or awesome) as Koreans would say! But for now, I'm binging on k dramas, watching till I drop and getting hook on their skin care products. The problem is, Korean skin care products are really expensive and me being the cheapskate, is rounding up stores looking for cheap but effective Korean skincare items. So in one of my jaunts, I saw this face mask at Watsons and I think it is a great find! I'm excited to share it with you especially my midlife women-sisters. 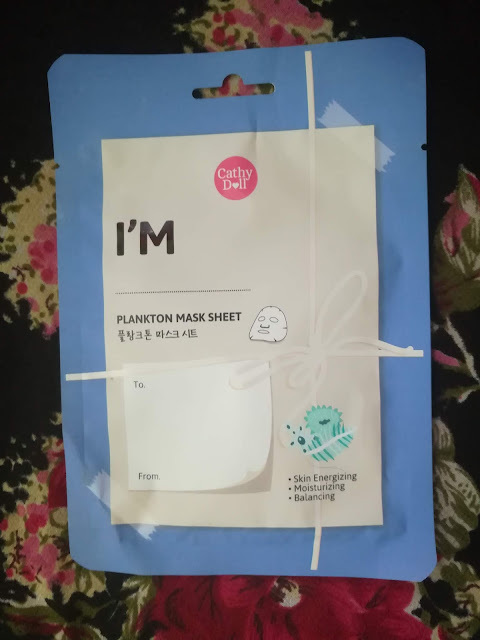 My special find is the I'M Plankton Mask Sheet by Cathy Doll. The I'M Plankton Mask Sheet "provides intense nourishment to the skin that is effective in skin regeneration with the use of plankton extract. This mask sheet provides the benefit of wrinkles reduction and skin cells repair to deliver luminous, smooth and radiant skin." I will now try on this mask sheet and uncover the truth behind it. How to use: After facial cleansing, apply the mask sheet on your face and leave it on for 30 minutes. Then, remove the sheet and rinse off with clean water. If there is any sign of irritation, stop using it and seek medical treatment. 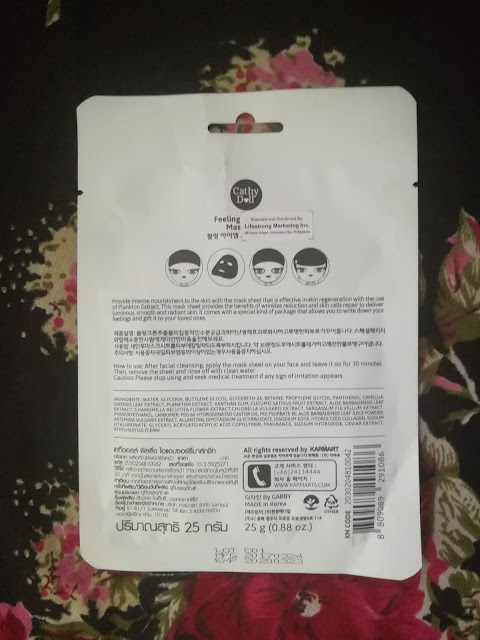 Before use: The mask sheet is packed individually in a sachet pouch. What's nice about it, is, you can give it as a gift without a need to wrap it. There's a section on the lower left side of the front of the sachet where you can write down the recipient and sender of this cute little item. During use: When I applied the mask sheet on my face, it feels cool and fresh. It is wet with the plankton extract, so I apply the excess extract on my neck and arms. I let it on my face for 30 minutes, and I didn't feel any discomfort such as stinging or itchiness. I was watching a movie while waiting for the time and the mask sheet feels soothing on my face. After use: When 30 minutes has lapsed, I removed the mask sheet. I rinse off my face with water per instruction. If you were to ask me, there is no need to rinse off with water because the extract doesn't feel greasy or sticky. There is no visible change as far as I can see it but after removing the mask, my face feels supple and smooth. Final Verdict: After using the mask sheet, my face feels supple & smooth. While it is on my face, it feels soothing & relaxing. Plus factor is, you can use the excess extract on your arms and neck. In fact, the used mask sheet won't go to waste either because you can wipe it along your thighs, legs & feet and they don't feel greasy or sticky at all. One use is not enough to see the visible effects, I suggest that you use it 2x a week, to see the effects on your skin. Recommendation: On a scale of 1 to 5 stars, with 5 being the highest, I highly recommend it and rate it 5 stars. 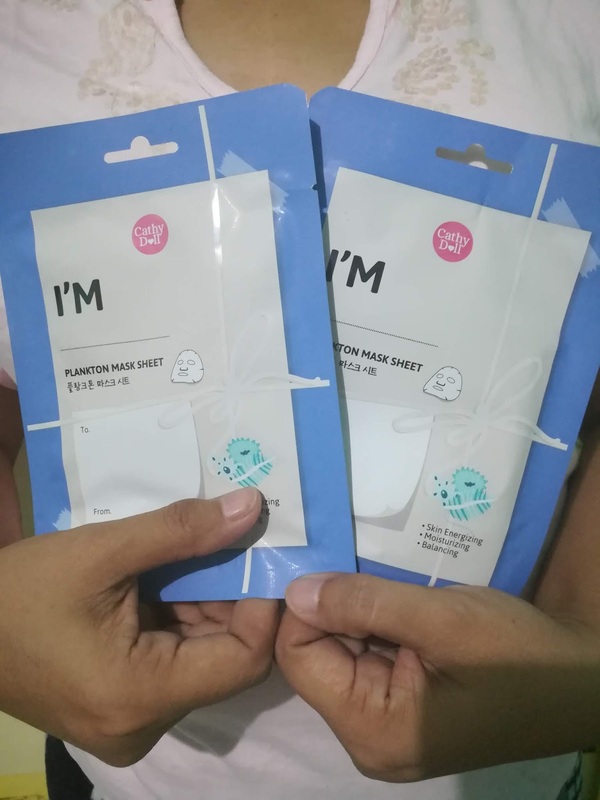 In one single use, you can feel the positive effects on your skin and second at the price of Php 59.00, this is very cheap because mask sheets are usually priced at Php 100.00 up. The properties of Plankton extract are: it is deeply moisturizing and soothing. It provides anti-aging, anti-wrinkle, and anti-cellulite properties. It supplies skin & hair with natural minerals and vitamins, especially for sensitive and irritated skin. With these, it is safe to say that I'M Plankton Mask Sheet is beneficial for us, midlife women. My dearies midlife women, let's take care of our skin and maybe you'd like to try this product too. The young ladies out there can benefit from this product also. If you had tried this product, care to share with the rest your experience with it. Just leave your comments below.